A lot of people have been noticing color in The Wire, so it’s a natural for the Splash the Color assignment. 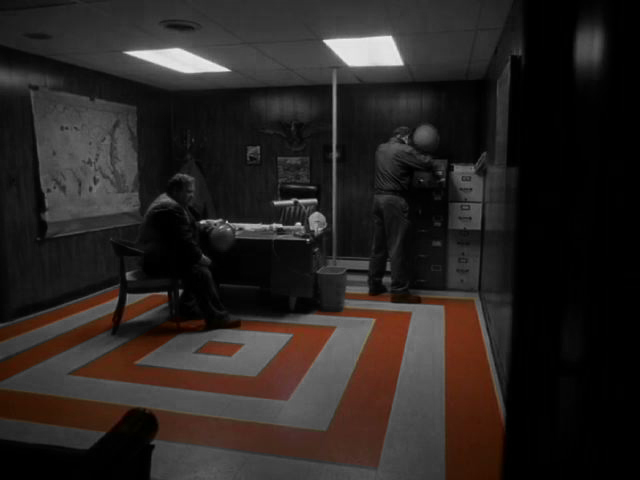 Here, I took one of the shots inside the Can Office with the orange target on the floor. I wanted to keep the orange and make the rest black and white. I did this by selecting the orange parts of the floor with the Polygonal Select tool (which I seem to use for just about everything) in Photoshop. This was a little tedious and you can see I missed a spot towards the back. Then I used the Select->Inverse function to change my selection to the rest of the picture – the part I wanted to be gray scale. To make it gray scale, I use the Image->Adjustments->Desaturate function. Saturation refers to the color intensity. No saturation = gray. The picture is really designed to be in color, and it shows in the grayscale version. Everything is dark and indistinct, because the color hues gave the picture its life, rather than the light and dark values. Draining the color also makes the scene much colder. The earth tones added warmth. This entry was posted in Uncategorized and tagged ds106, VisualAssignments, VisualAssignments340, wire106. Bookmark the permalink.